Jesus told a story of a tax collector who went to his house justified rather than a religious Pharisee. Why was the tax collector justified? Jesus gave this parable to illustrate the peril of self-righteousness. To learn more about the danger of this attitude and about the attitude Christ wants us to have, watch this short video presented by Dave Myers, Foundation Institute instructor. Jesus Christ often spoke in parables or stories using familiar settings, and He often spoke about various segments of the population. A Pharisee was very religious. He belonged to a sect of the Jews that went to unnecessary extremes in trying to obey the laws. He was very strict in his lifestyle and was often self-righteous and critical of others. Tax collectors, on the other hand, were considered immoral men. They often grossly overcharged people as they collected taxes for the Roman government. They were not viewed favorably and were often treated with disdain. Each man’s prayer was different from the other, and it is instructive for us to consider. The Pharisee’s prayer is mentioned first: “The Pharisee stood and prayed thus with himself, ‘God, I thank You that I am not like other men—extortioners, unjust, adulterers, or even as this tax collector. I fast twice a week; I give tithes of all that I possess’” (verses 11-12). Remember the reason Christ presented the parable. It was for “those who trusted in themselves that they were righteous, and despised others.” The Pharisee’s prayer was exactly that—a self-serving attempt to tell God how righteous he was. It reeked of vanity and ego. But notice the difference in the prayer of the tax collector: “And the tax collector, standing afar off, would not so much as raise his eyes to heaven, but beat his breast, saying, ‘God, be merciful to me a sinner!’” (verse 13). Here was an obvious situation where the man recognized his guilt, and he stood afar off. He acknowledged his sins and asked for God’s mercy. He was asking God to forgive him. Jesus then tells His audience what they needed to learn from this story: “I tell you, this man went down to his house justified rather than the other; for everyone who exalts himself will be humbled, and he who humbles himself will be exalted” (verse 14). The tax collector was not justified by any of the deeds of the law, but by his repentant, humble approach before God, by his acknowledgment of sin, and by his faith in God demonstrated by calling upon His mercy for forgiveness. The lesson is that this tax collector went to his home justified (the Pharisee did not). The tax collector was not justified by any of the deeds of the law, but by his repentant, humble approach before God, by his acknowledgment of sin, and by his faith in God demonstrated by calling upon His mercy for forgiveness. The Bible often speaks of being justified, made free from guilt, by faith. “Therefore we conclude that a man is justified by faith apart from the deeds of the law” (Romans 3:28). Some people think they can be justified—made righteous and just and innocent in God’s sight—by doing good deeds specified in the law. That was the Pharisee’s attitude, but it was actually the tax collector who was justified by God’s mercy. The tax collector repented. He acknowledged he was a sinner and asked for God’s mercy, and he was justified. In the conclusion of the parable, Christ reminded the audience that “everyone who exalts himself will be humbled, and he who humbles himself will be exalted” (verse 14). The tax collector was humble and was in a repentant frame of mind. He was the one justified. The Pharisee was not humble, but was quite proud, and was not justified. The Bible often speaks of the need to avoid pride. Notice what Solomon wrote about how God views pride: “The fear of the LORD is to hate evil; pride and arrogance and the evil way and the perverse mouth I hate” (Proverbs 8:13). God hates pride. But God does give grace to the humble. The apostle James wrote: “But He gives more grace. Therefore He says: ‘God resists the proud, but gives grace to the humble’” (James 4:6). “Humble yourselves in the sight of the Lord, and He will lift you up” (verse 10). The apostle Peter reiterated the same thoughts: “Likewise you younger people, submit yourselves to your elders. Yes, all of you be submissive to one another, and be clothed with humility, for ‘God resists the proud, but gives grace to the humble.’ Therefore humble yourselves under the mighty hand of God, that He may exalt you in due time” (1 Peter 5:5-6). 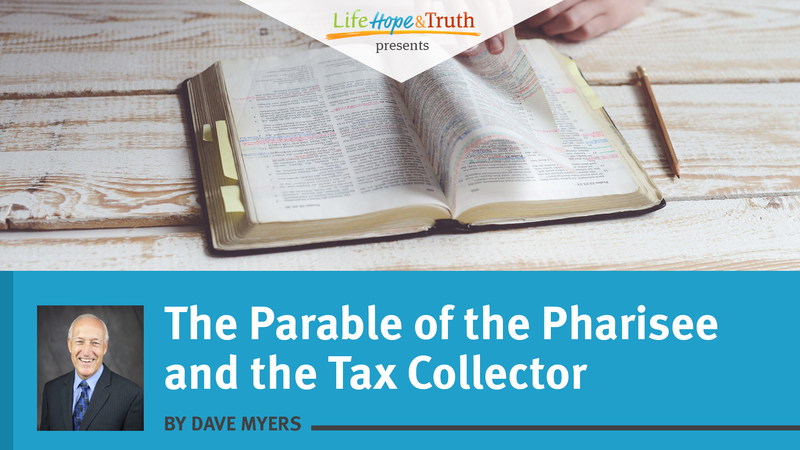 The Pharisee and the tax collector were figurative of typical attitudes that are common even in our age today. One man was full of pride and was quite self-righteous. The other was humble; he recognized his sins and asked for God’s mercy and was justified. Which one will you be? Learn more about how God wants us to respond to Him by downloading our free booklet Change Your Life! Self-Justification … or Justified by God?